ALMs seek to incorporate data from new sources (such as social media mentions) along with traditional measures (such as citations) to present a richer picture of how an individual article is being discussed, shared, and used. Knowing the impact of your research can be invaluable when you’re applying for funding, seeking a new position or working towards a promotion. As a published author, Stats provides you with a unique, connected view of how your published articles are performing in terms of citations, views for articles you have published in an Elsevier publication and Mendeley sharing. Mendeley Stats is an Elsevier service for authors, but is not limited to Elsevier publications. Based on Scopus, it also provides citation information for articles published with other publishers. To access your personal Stats, simply visit https://www.mendeley.com/stats/welcome. This powerful tool allows you to see how your work is being used by the scientific community, using data from a number of sources including Scopus, ScienceDirect, Mendeley and NewsFlo. Stats delivers your publication readership data within days of publication. As an author, Stats helps you understand in greater detail and with greater speed how your publications are being read, shared, cited and mentioned in the media. This service is available to anyone who has published and whose publication is indexed in Scopus. Early feedback about how your publication is being viewed, shared and cited. Where in the world your ScienceDirect publications are being viewed. Detailed information about how your ScienceDirect publications are being discovered. The discipline of the people that have shared your publication in Mendeley. When you and your work are mentioned in the media around the globe. Scopus is the largest abstract and citation database, representing 5,000 publishers and delivering a comprehensive overview of the world's research output in the fields of science, technology, medicine, social sciences, and the arts and humanities. ScienceDirect is home to almost 16% of the world's peer-reviewed, full-text scientific, technical and medical content. Mendeley is a free reference manager and academic social network that helps you organize your documents, collaborate with others online, and discover the latest research in your field. 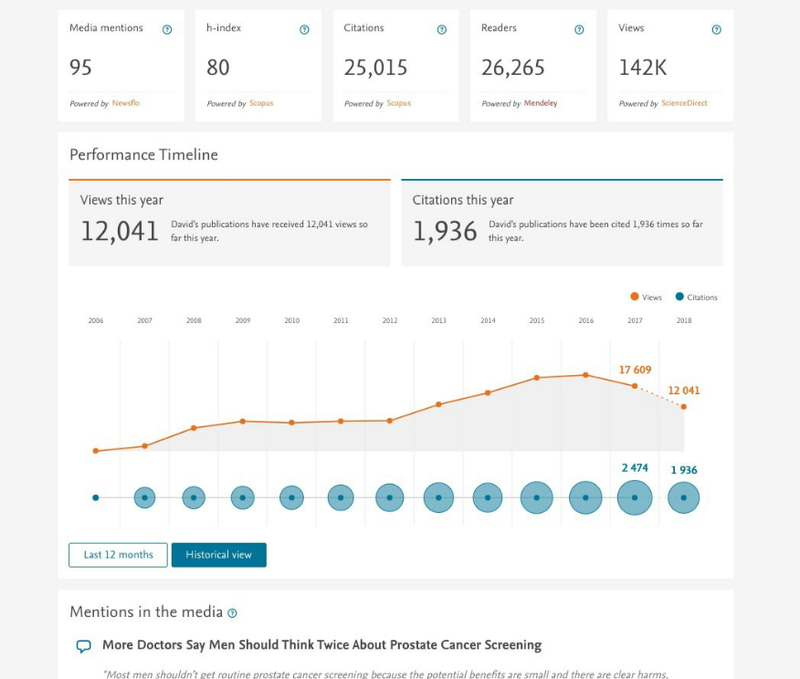 Newsflo lets researchers know when they or their articles are mentioned in +55k public sources and +100k subscribed general media clustered around topics. Elsevier has combined the content, technology and researcher networks of these resources to create your personal dashboard, providing a new, more visual way for you to view citation and exposure data about your publications. Once you have accessed your Stats page for the first time, you'll receive frequent updates email to notify you about updated metrics: New publications will be added automatically as you publish them. You can check your personal Stats page at any time. Make sure your Scopus profile includes all your articles, so you can easily monitor their impact. If you have an existing account with ScienceDirect, Scopus or any other Elsevier product, you can use those credentials to sign in. You have the choice to share your articles only via the social media buttons at the bottom of each article’s metrics page or via the Mendeley network. Check out these answers to frequently asked questions about Stats. Plum Analytics’ metrics are incorporated into Elsevier’s world leading research products – Scopus, ScienceDirect and Pure, as well as Elsevier’s leading journal and society partner sites. PlumX Metrics provide insights into the ways people interact with individual pieces of research output (articles, conference proceedings, book chapters, and many more) in the online environment. We categorize metrics into 5 separate categories: Usage, Captures, Mentions, Social Media, and Citations. Many journal homepages display the top 10 most popular articles according to PlumX social media mentions.